Do you restrict the amount of television your children watch? When I was a kid, I was only allowed to watch an hour a week of television. I had friends that could watch it whenever they liked, and as much as they liked. Do you limit the amount of television your children can watch? When my kids were primary school age they were only allowed to watch about an hour of TV per night. We would use the Wii to play games on instead of TV. 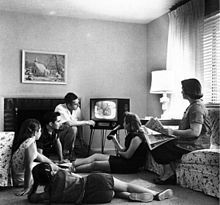 When they were of high school age they were allowed to watch up to 2 hours of TV per night. Now at ages 17 they are not so interested in TV anymore but use their laptops more often. We don't have a set number of hours they're allowed to watch, they just aren't allowed to watch it during meals, and if I think they've been watching too long I'll encourage them to turn it off and come and play outside or something. Yes, my kids only watch one movie a week. They're still young and I don't want them to get into the habit of relying on it for entertainment when they could be playing games and creating things. I wouldn't deny them a bit of TV, and on the holidays, yes, I get a bit lax and let them watch a little more, but on the whole once a week is enough. I will when he begins to watch it. Too much time can be wasted in front of the 'idiot box'. As a child, we were not limited in the time we could spend watching television. It would have been nice to have been encouraged to play some more sports or something.